There are a lot of eggs in Switzerland’s Jungfrau Region. Studying a map of the Bernese Oberland I immediately spot Grosse Scheidegg, Brandegg and Winteregg in the mountains above Interlaken. In the lilting, crackling tones of the local dialect — a version of German that I’m finding tricky to follow — ‘egg’ is pronounced like ‘eck’. “It normally means a place on a mountain with a good view,” explains Brigitte, my guide. We’re sitting on a train heading up to Grindelwald and are rolling up a hillside on one of the trains operated by Jungfrau Railways. Many international travellers are drawn to the region by the prospect of viewing the Alpine scenery, yet some cross continents purely to see and experience the ingenious, cog-based system that enables trains to ascend and descend steep inclines. It has been operational since 1896. Looking back towards town, Brigitte explains that Interlaken’s name is derived from Latin, denoting the municipality’s location between two lakes. 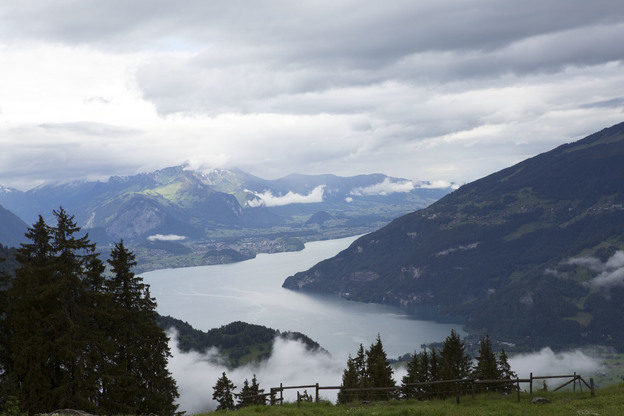 Lake Thun and Lake Brienz sit either side of the town, which was known as Aarmühle until the last decade of the 1800s. It seems like some bright spark involved in tourism marketing had the idea that the name Interlaken would have broader appeal. At Zweilütschinen we pass the point where the River Aare splits. The body of water once lent its name to the municipality. With Alpine meltwater in full flow, we can hear the hiss and splash of white water above the rhythm of wheels on rails. We roll past wood-fronted chalets with flowers on their balconies and meadows lush with long grass. Mixed woodland shrouds the lower slopes of the mountainside. Brigitte points to waterfalls tumbling from the rocks. 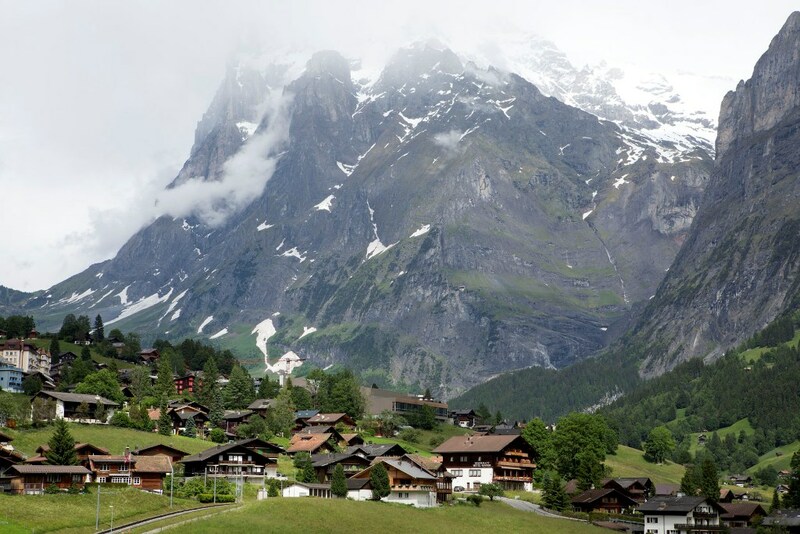 We’re Lauterbrunnen, an area that’s popular with cyclists and walkers. In German, the name is logical, reflecting the fact that the valley is the home to numerous waterfalls. At Grindelwald we step down from the train and walk through the village. Literature at tourist information office makes it clear this region is popular with Chinese tourists. We head to the cable car station to take a gondola up to the First – Top of Adventure station. Chunky looking tan and white Simental cows clang in the steep meadow, beneath low hanging clouds and mist that’s becoming ever thicker as we ascend into mountains. Their tinny clanging and the chirping of birdsong rises to us. I listen to the odd mountain symphony that also features the constant whir of the cables. We then stroll to Lake Bachalpsee, a mountain lake that on sunnier days reflects the snow-capped peak of the Schreckhorn. Snow lies on the ground and Brigitte ruefully comments that she’s missing the presence of dainty Alpine flowers, such as enzian and soldanella, that are normally visible at this time of year. The First Flyer is closed due to the misty conditions. The flying fox runs for 800 metres down the mountainside, giving people the opportunity to zoom along at up to 84 kilometres an hour. It’s one of several adventure activities in the Jungfrau region. 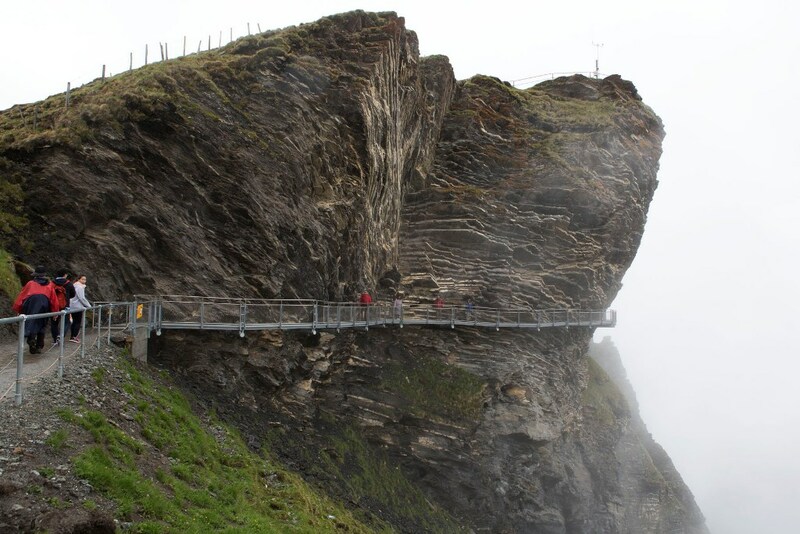 Instead we tread on the metal frame of the First Cliff Walk by Tissot. To my relief, the cliff-side walkway is pleasingly stable. 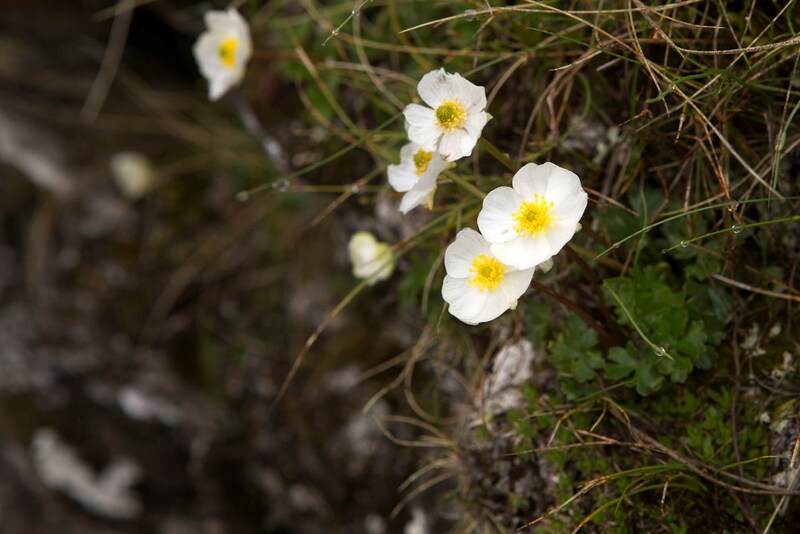 Cautiously, I lean over the side to photograph some of the Alpine flowers that bring a smile to Brigitte. We then proceed to jutting observation platform that on, clear days, is reputed to have fine views of surrounding peaks. At the Berggasthaus First we pause for a warm drink and a bite to eat. Lambskins line the wood benches of the mountaintop restaurant. The menu features traditional Swiss dishes and local spellings. I consider opting for the Gmüespfannä (vegetable pan), Röschti (rösti) or Älpler, featuring pasta, mountain cheese, potatoes, bacon and apple sauce. I’m uncertain what to choose. How about that for an Alpine cliffhanger? KLM flies from across the UK to the airports at Geneva and Zurich via Amsterdam Schiphol. 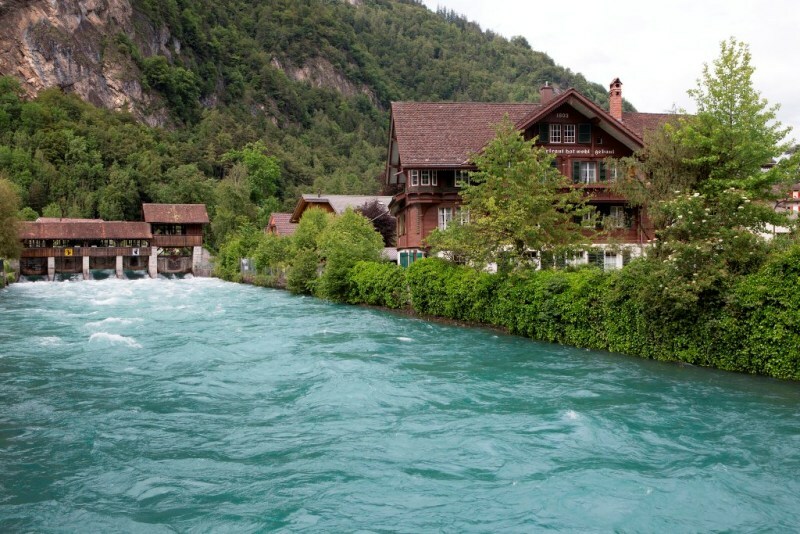 Interlaken is just over two hours from Zurich Airport by train. A Swiss Transfer Ticket provides access to Switzerland’s network of trains, buses and boats. The Jungfrau Railways network provides connections to stations around Interlaken, including access to Alpine glaciers, lakes, waterfalls and meadows. 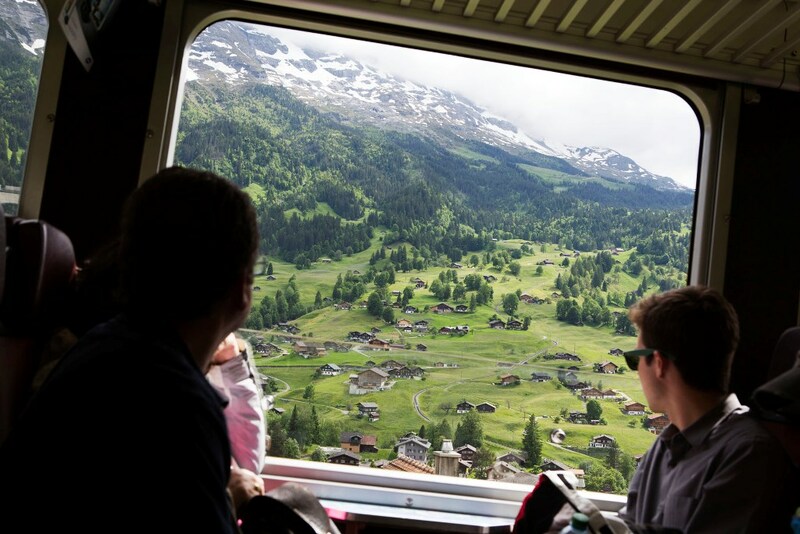 A Jungfrau Railway Pass, is valid for from three to six consecutive days of travel. VIP passes also provide access to this UNESCO World Heritage adventure destination. Hotel Interlaken (Höheweg 74, 3800 Interlaken; tel. +41 (0)33 8266868) is a family-run 4-star property on a site that has been providing hospitality since the 15th century. The 61 guestrooms are modern, ranging from cosy single rooms to suites with two beds. The hotel is less than 10 minutes’ walk from Interlaken Ost railway station and the town centre. Tuck into a giant schnitzel or traditional Swiss dishes at the Harder Kulm Restaurant (tel. +41 (0)33 828 7311), which stands on a mountaintop 1,322 metres above sea level. The restaurant has a terrace and can be reached by funicular or by a path weaving up the mountainside. A steel platform juts from the terrace and is a popular spot for taking photographs of the Eiger, Mönch and Jungfrau mountains at sundown. 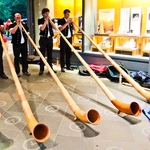 On Saturdays, throughout the summer season, Swiss bands play live folk music at Harder Kulm. If you have eaten your fill of schnitzels and cheese fondues, and fancy a good curry, book a table at Spice India (6 Pastgasse, 3800 Interlaken; tel. +41 (0)33 821 0091). Run by the Mathur family, the long-established restaurant serves Mughlai cuisine and dishes prepared in the tandoor. The specialities of the house include murgh chakori, dal makhani and gulab jamun. 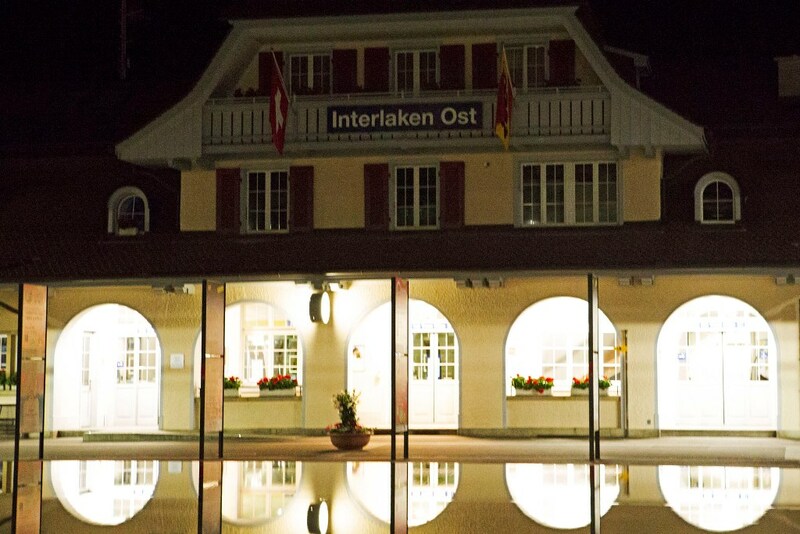 See Interlaken Tourism for information about the town and nearby attractions. The Jungfrau website holds information about the region, encompassing the Schynige Platte, Eiger Glacier and Lakes Brienz and Thun. 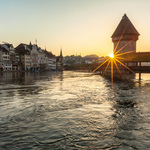 The My Switzerland website holds a wealth of information about transport, heritage plus things to see and do across the country.